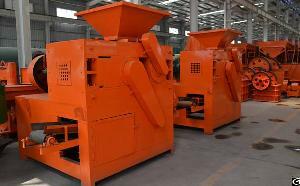 machine plant can be used to press coal, charcoal, coke, mineral powder, etc. The final briquettes can be transformed into different shapes like oval shape, pillow shape, egg shape, etc. It's usually used to press coal or charcoal dust, also named coal briquetting plant. Lingheng could according to customer's raw materials, production capacity to customize the complete briquette production line. Offers free technical support. Lingheng ball press machine plant for sale can be divided into coal briquetting plant, charcoal briquetting plant, fluorite powder briquetting plant, etc. Lingheng briquette machine has two larger rollers in a fixed position in the frame. The other two smaller rollers are moveable. As its named implies, it has four rollers and does twice pressure in the production of briquettes. The briquette is stronger and has in a higher density, and the surface of briquettes is smoother. Double shaft coal mixer especially applicable for coal powder, slime, middlings, coking coal, coke breeze, dusting ash, pond slob, fire coat, steel slag, iron fine power, aluminum ash powder etc, The machine adopts two-shaft vane staggered forms, during the operation, it could perform pushing and mixing (for the screw type, when pushing, it performs mixing as well, three advances and one back, after the three leads, one adverse single lead will push the materials back so as to well mix the materials).It is applicable to match with the production line. This machine is mainly used in powder material, granular materials, it is easy to get out. It can also be used for the material of package, such as coal, charcoal, coke, debris, sand, cement, fertilizer, etc. Its transport bulk density is less than 1.67 t/m3, conveying the temperature of the material is less than 60. Shape and the length of the machine, according to the client's requirements. When you transfer the material, you can use the electric drum position driving and driving devices. Crusher is a machine used on the surface of the metal fracture or compressed into small bits and pieces of pieces or dense mass materials. The vertical complex crusher developed and designed by our team of highly qualified engineers is used to reduce the size of the coal, charcoal, coke, lime, stone and such kind of materials into smaller sizes, so they can be more easily disposed of or recycled, or to reduce the size of a solid mix of raw materials (as in rock ore).